18 months is a tricky age. A baby is now almost definitely a toddler, i.e. she has started to walk with fair bit of comfort.. She is so keen to explore her surroundings that food is most probably the last thing on her mind. She wants to use her new-found independence by rejecting almost all advances to help her in any way. This includes feeding. Most parents face the challenge at this age where their toddlers do not want to be fed and they feel baby is eating almost next to nothing. I and my baby went through this phase too. Many toddlers start looking skinny at this age which can be quite distressing for parents after having seen the chubby babyhood. You can make life easier for yourself and your baby by following a few simple tips. Finger food at this stage can be a life-saver. Toddlers have a natural tendency to defy what others say. They want greater control of their environment and sitting and doing what others tell them to do goes against their grain. Finger food provide perfect way to eat them where they can control what and how much they are eating. Most parents get frustrated at this stage because toddlers just wouldn’t listen to what they want to tell them. You try to force-feed the kid and try to offer what you consider is ideal for her growth, but your little devil is having none of it. The way out is to surrender and accept that you have to find a middle way. Offer food to child when she is hungry but do not fret if she does not finish it. Toddlers love playing and are looking for new experiences. Try telling stories, make a game of eating. My daughter is now 4 years old and I still tell her stories sometimes at mealtime. It doesn’t take much and meal time becomes pleasant. Stories make her even finish her milk which is certainly not a favourite. For a long time, I kept adding other foods to replace milk in her diet as she wouldn’t have any of it. But now, she drinks provided I tell her a story. You cannot expect an 18 months old to finish food in 10 minutes flat. It just will not happen. ACCEPT IT!! Keep a window of 30-45 minutes for meals at least. Post this, if your toddler is still not eating, just remove the plate. Do not force to finish. Variety is the spice of life even for an 18 months old. Try to offer simple but different items to expand her palate and keep her interested in meals. This can be one of the best things to follow if you want your child to enjoy meals and have healthy habits in the long run. Children learn by following others and parents are the best role models. When children watch their parents enjoying healthy food they are more probable to try and enjoy them. Every one likes to get appreciated,so be lavish with praise but do not overdo it so that the child starts eating just to get praise. Food is essential for us and it should be enjoyed and chosen well for good health. I can personally vouch for this. I was always vocal about what is healthy and what is not. My daughter knows chips and burgers are junk and homemade food is healthy and good for her. I however do not ban all junk completely. She has her occasional donut when we go out. Idea is not to deprive but to enlighten them! Deprivation will only cause craving. She knows vegetables are good for her. I get looks of surprises when people at restaurants see her asking for and devouring steamed vegetables and preferring watermelon over ice creams. Parents are their children’s first role models specially mothers. They want to emulate you and be like you. If you have good eating habits and are health-conscious, there is a fair bit of chance that they will be too. You will most probably get a lot of advice as well as comments about how you are feeding your child enough and child is losing weight blah blah. But if you and your child’s doctor are OK with how she is growing, learn to develop a think skin and ignore what they are saying. You and your child will be better off in the long run. 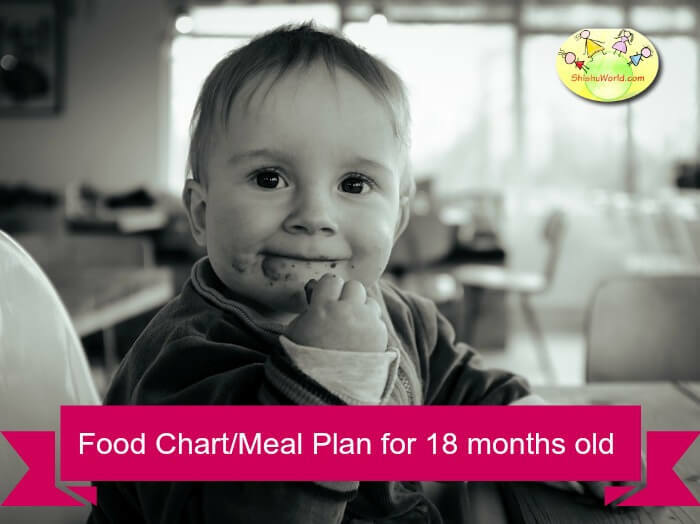 Here is a sample food chart/ meal plan for a 18 months old. Feel free to modify this chart as per your and your toddler’s preference. Remember that these are only guidelines and you should use these as a reference but feel free to tweak as you might like for your baby. We try to introduce lot of variety of food to toddlers. This makes them more open to trying newer tastes and will help to ensure they are not picky about food. Since 18 months old toddlers may not eat a lot of food at one go, you have to keep offering them something every few hours. Your toddler might appear to have lost weight, which is quite normal as toddlers become more active at this stage. Even if your toddler looks skinny, try not to give unhealthy foods like too many sweets and fried items in the hope that she will gain some weight. It doesn’t work, in fact it will only reduce their appetite for healthy food. We hope this food chart will help you in planning your toddler’s meals. If you like this, do not forget to share it. Please leave a comment to ask a question or let us know your feedback. You can follow us on Youtube, Facebook, twitter and pinterest. Hi Anit, How old is your baby? You have not mentioned any thing about Non Veg. Is there any reason a 18mts can eat chicken or fish or mutton. You can give non-veg at this age. We have a non-veg food chart for 2 years too. I had 17month baby boy .but he not interesting from eating .please help for my baby starting eating. Can you please send me diet chart for my baby, my baby boy is 18 months old. We already have an 18 months food chart on the site. My 18 month old twin boys keep me running after them for food. Some days they eat..n some days they don’t eat at all..what should be the total amount of milk to be given in a 24 hr day. Kindly suggest me some easy n quick recipes.